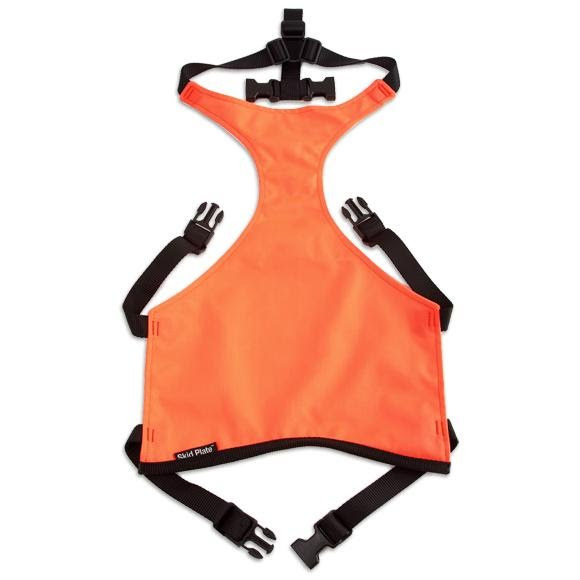 The Skid Plate protects your dog's chest, stomach, and side areas that are hardest hit when in the field and is a commercial grade dog chest protector that can help prevent injuries to your best friend and costly visits to the veterinarian. Made with two layers of 1000 denier Cordura nylon for extreme durability and resistance to the worst abrasions, cuts and punctures the field has to offer. The Skid Plate protects your dog&apos;s chest, stomach, and side areas that are hardest hit when in the field and is a commercial grade dog chest protector that can help prevent injuries to your best friend and costly visits to the veterinarian. Made with two layers of 1000 denier Cordura nylon for extreme durability and resistance to the worst abrasions, cuts and punctures the field has to offer. Designed with the dog in mind, the Skid Plate offers high visibility and total mobility with an open back to avoid over heating. The strap system is made of rugged nylon webbing with quick release buckles to ensure it stays on while providing the best possible fit. *Weights listed are for quick reference only to be used when measurements are not available.